I live near Armavir Marz, which I used to think was the most boring, un-touristworthy Marz in Armenia. Sure, it has Echmiadzin, but that's all the way in the East, and really more of a suburb of Yerevan anyway. I thought there was nothing else to see in the Marz. But I found out that I was wrong! Armavir Marz boasts not one, but two excellent and under-discovered museums, both of which are only a short drive from Echmiadzin and Yerevan: The Metsamor Archaeological Site and The Sardarapat Museum and Memorial. The Sardarapat Museum and Memorial is the site of a last-ditch battle in 1918 between the nascent Republic of Armenia and the forces of the Ottoman Empire, who wished to reclaim Yerevan, Gyumri (then Alexandropol) and Tbilisi. The Armenians won, ensuring the survival of the nation and the people. Memories of the battle were soon eclipsed by the arrival of the Red Army in 1921 and the establishment of the Armenian Soviet Socialist Republic. But in 1968, a memorial was erected, accompanied by an ethnographic museum. On the November day I visited, the grounds of the memorial were completely empty, which certainly added to the monumental feel of the Soviet Architecture. It took a full ten minutes to cover the distance from the memorial to the ethnographic museum, during which time I saw no other people. I did, however, note a plaque, a bronze copy of a proclamation by the Senate of the great state of New Jersey memorializing the Battle of Sardarapat. When I got to the museum, the staff quickly turned the lights on for me. I was impressed. It had obviously been recently renovated. Someone turned on a new flat-screen TV and popped in a DVD with a program about the architecture of the memorial and the museum, which is built like a caravanserai. The museum exhibited clothes, weapons, pottery and artifacts of daily life, including a working loom. In the central courtyard is an exhibit dedicated to the battle, showcasing the weapons and tactics used. As I was walking around, I suddenly heard English voices echoing through the stone corridor. I raced up to the second floor. There was a small group of tourists from Finland! I listened to the rest of the tour, then introduced myself to the guide. Over tea and apple slices in front of the electric stove/space heater in a back room, she told me she was an English teacher at a local village school who moonlighted as a tour guide on weekends. We exchanged numbers, then I began the long walk back to the complex’s entrance. The Metsamor Archaelogical Site is located near the village of Taronik, about 10km west of Echmiadzin. From the Bronze Age until the 17th century AD, the area was a thriving urban center. Its residents produced and traded gold, obsidian, ceramics and other valuable commodities that were dug up during excavations in the 1950’s, 60’s and 70’s. At the Metsamor Museum, you can see the ruins of ancient observatories and factories, as well as artifacts bearing the marks of the empires that rose and fell around Armenia: Babylonian Cuneiform Seals, Assyrian Bulls, Hellenistic Vases. When I visited in January, I was the only guest. I got a tour from Ashot, a stout, sturdy scientist and archaeological expert who spoke some English, and Mariam, a pretty young student and translator from Echmiadzin. They took me to the padlocked iron gate to the basement. 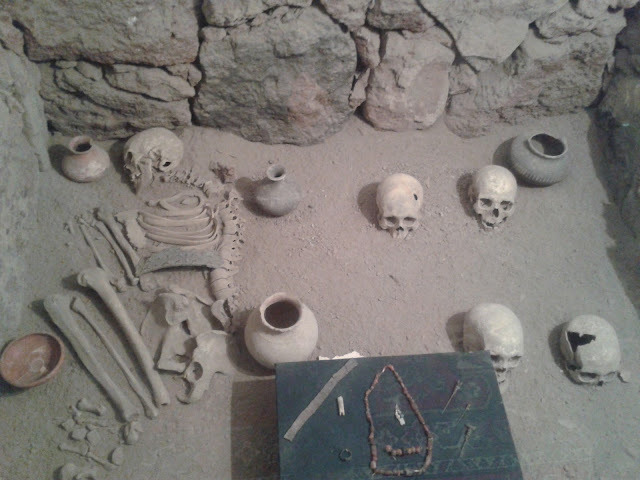 The only light came from the display case, which housed a skeleton lying in a fetal position, surrounded by jewels and accompanied by three skulls, each with a hole in the side of their head. “He was a rich man, buried with his servants” said Mariam. with cuneiform that noted it weighed precisely one shekel, about 8.5 grams. After coming out of the basement, I walked the grounds with Ashot while Mariam stayed warm inside. We picked up ceramic shards from the dirt. He gave one to me. The Saradarapat Memorial and the Metsamor Site are located in villages in Armavir Marz and are difficult to reach by public transportation. The best bet is to go to the Marz’s capital city, Armavir (also called by its Soviet name, Hoktembryan), and hire a taxi from there. Trains go from Yerevan to Armavir 4x a day, and busses run every 10-15 minutes from the Kilikia Bus Station, across the highway from the main hall. Sam is an American Peace Corps Volunteer who lives and works in Aragotsotn Marz. A version of this piece originally appeared on his blog: www.heyamerikatsi.com. The views and opinions expressed are his personally and do not necessarily reflect those of the U.S. Peace Corps.